At the start of the 2010 school summer holidays, 18-year-old Charlotte Jones was a hard-working student who was about to enter the final year of her A-levels. She was living a normal family life in Woking, Surrey, with her mum and partner, and younger brother and sister. But within a few short weeks all that changed. 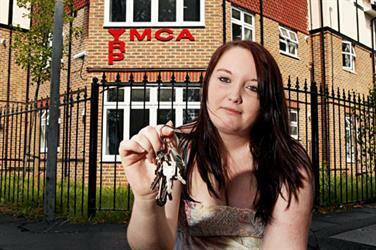 Her mum had become pregnant again and wanted to move out of the area. It led to constant arguments between Charlotte and her mum, which grew increasingly ugly. By the start of the academic year, Charlotte’s family moved away to Walton-on-Thames, leaving Charlotte to stay with her grandmother in Woking while she completed her studies. Life there was far from ideal. She had to sleep on a sofa because her uncle lived in the spare room and she found it difficult to find space to concentrate on her studies. Her grades began to slip and by Christmas she had been kicked out of college. Shortly afterwards her GP diagnosed her with depression. “It was a terrible time,” recalls Charlotte. “I didn’t know what to do, so just stayed on my gran’s sofa. I didn’t know who to turn to.” “Although I was at my gran’s, it never felt like home. I was on the sofa. My stuff was everywhere. If my uncle ever went away I’d use his room for a few days. It was the only chance I got to stay in a bed,” says Charlotte. “It was really hard to study. I tried to stay back at college but it was really difficult. I was so upset when they told me to leave,” says Charlotte, who had left secondary school with eight GCSEs, including an A in maths and an A* in health and social care. Grove Court, where Charlotte now lives, offers 24 beds to homeless people. Housing project manager James Alexander is on hand to offer advice on living independently. The block also has a warden, and counselling and careers advice are available through the YMCA’s Ypod youth centre, which is near to her flat. Charlotte has been particularly grateful for the budgeting advice she has received from the YMCA to ensure her income from housing benefit and wages from a part-time job stretch across the month. “They have been really supportive,” she says. “The rent is paid weekly and I get paid monthly so it could have been difficult for me. But we’ve sorted out a good payment plan so that I can then give myself a weekly budget,” says Charlotte. Not all vulnerable young people are so fortunate. Deep cuts to grants such as the Supporting People funding have had a dramatic effect on the availability of housing support to young people across the country (see below). In Surrey, the Supporting People fund has been cut by 9.4 per cent from £17.9m to £16.2m, leading to further pressure on already tight resources. Terry Eckersley, chief executive of Woking YMCA, says Charlotte was able to be housed quickly due to the fact she had a relatively low level of need and a space had become available. But the problem is more acute for young people with more complex needs. “For those that need a home and more intensive support, such as addiction services, there just isn’t the funding,” says Eckersley. He adds that the organisation is having to become “creative to ensure we can help young people at Grove Court”. For example, the YMCA housing project manager’s salary has been met through the exempt accommodation rule within housing benefit, which allows the charity to effectively receive more housing benefit to cover support for its tenants. “He is there to help them with tenancy issues, but does more than that. He can help them with a range of issues,” adds Eckersley. Now that Charlotte is more settled, the relationship with her mother has improved and she regularly visits her family’s new home in Walton. She is also planning to return to college in September to start a health and social care course. “I did well in health and social care at GCSE and am much more interested now in working in health or social care, looking after children, the elderly and people who need support,” she says. “The homelessness sector is facing an extremely challenging period. Public sector funding for homelessness charities is down by an average of 25 per cent, with some charities more significantly worse off. This challenge comes at a time when homelessness is rising. Research from the University of York, commissioned by Centrepoint, shows that the number of young people experiencing homelessness each year has risen from 75,000 to 80,000. For Centrepoint, the cutbacks have meant the withdrawal of virtually all government support for the health, education and employment programmes we provide for these vulnerable young people, as well as a significant reduction of basic housing support. Without this support, organisations such as Centrepoint are in danger of becoming a sticking plaster rather than offering a long-term solution. We have to be more creative with our fundraising to fill the gap and more innovative in how we spend it. Centrepoint has been fortunate to receive funding from a range of supporters. For example, the property and construction sector charitable trust, Land Aid, is helping to meet the costs of our learning services this year.